A special festival celebrates the love of dogs. In Nepal, Hindus celebrate Diwali, a festival of lights celebrated by millions every year in the fall in India, Nepal and elsewhere. 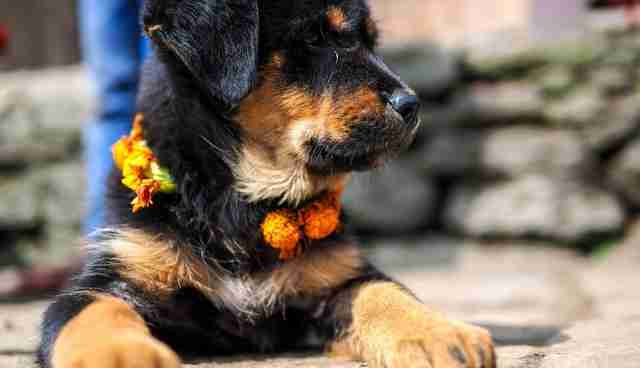 Specific to Nepal's parties, though, is a day dedicated to dogs, called Kukur Tihar. This photo showing dogs wearing floral garlands at the festival was catching clicks on Reddit recently. The beautiful image prompted other dog lovers to share photos of their dogs celebrating being the beautiful creatures they are. Garlands are given to dogs - all of them, pets and strays alike. The images honoring the animals are truly breathtaking. People on social media drew the comparison as well, giving heartbroken dog lovers a reason to feel hopeful again. "For all of you as disturbed as I am by the #YulinDogMeatFestival in #China," this Instagrammer wrote, "Here is some happier news about a festival in #Nepal that honors dogs for their special friendship with humans on the second day of #Tihar." Some people, seeing these images, decided to adorn their own pups in flowers. Posts from all over the world echoed the sentiments of Nepal. Now that's how animals should be treated. We can hear your sighs of relief for humanity from here.